Well if that title doesn't draw you in I am not sure what will! Thank you for all your well wishes for my procedure last week. Can I say that I was much, much more nervous than I needed to be? It all went well and now I don't have to get another one for ten years, yay! I was not worried about the prep, we have all had the flu and food poisoning which is much, much worse than the prep was. I was nervous about not eating for so long due to my hypoglycemia. I did not eat for 41 hours, which is a very long time for me. I had juice, tea and even chicken stock, which got me through it but boy did I suffer with a headache all last weekend and into the week. That was the worse part, just feeling so weak. But again, it is over and done with and I don't have to go back. In ten years they should have a really easy test that is more reliable than the Cologuard that is out right now. If you are putting this procedure off don't. It is a pain but it is worth it if they catch something very early. My doctor told me 40% of women have polyps that need to be removed. Most aren't cancerous, but you don't want them to become cancerous. My husbands best friend died of colon cancer three years ago. He was 61 and had never had a colonoscopy before he experienced abdominal pain and problems with digestion at the age of 60. He would be alive today if he had had the test in his 50's. He was a vibrant, loving man and now his wonderful family has to face life without him because he did not want to have the test. They still struggle with his loss every single day. Okay, end of lecture, let's move onto the week. I have had two unexpected finishes this week and I am pretty happy about both of them. First off this very simple crochet cowl is hot off the hook. This has been my car project since January. When I have a few minutes between patients I pick it up and add a few rows. Each row adds up even if you only get in one or two a day. 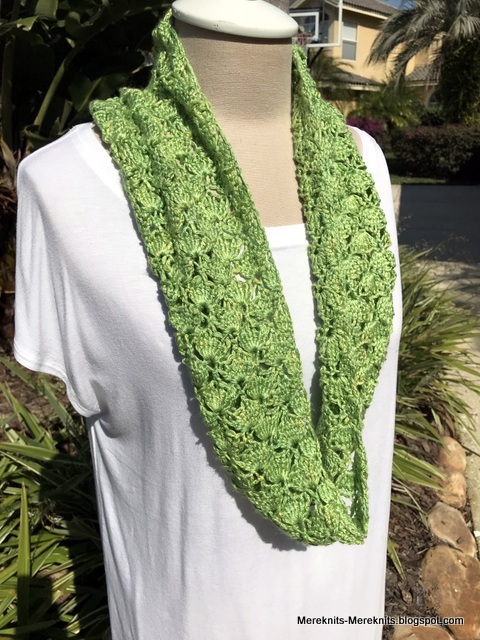 This is made with hand painted mulberry silk yarn from Sweaterkits. I bought this yarn ages and ages ago when one of my favorite little yarn stores closed. It is so, so soft, just gorgeous to touch. I used almost every inch of the 300 yards in the skein and a size H hook. 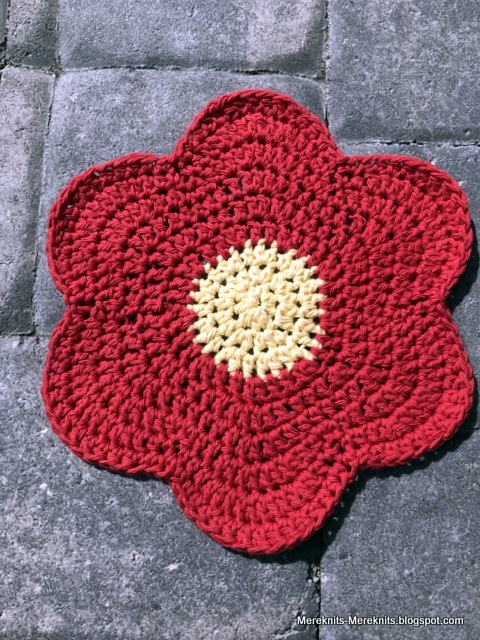 The pattern is a simple 7 stitch treble crochet shell. I made two scarves from this pattern last year. Easy and beautiful. Made for a dear friend, I hope she will like it. 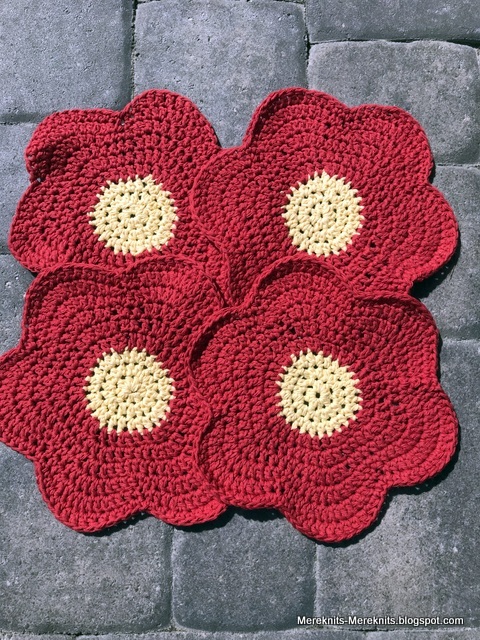 Four Flower Power Dishcloths were made up last night and today for another friend. Ms.Opal helps out at one of my medical foster homes. She is a hoot and I just love her. She was telling me how much she loves crochet or knitted dishcloths the other day. So on my day off yesterday I popped by Joann's to get two balls of Sugar and Cream yarn to make these up. She told me she has red decorative accents in her kitchen and so I chose the red as the primary color for the flower, plus it won't look like it is dirty as easily as yellow would. This is a super easy pattern, I have made many of them before. I did add a row to the pattern, some sort of sc, hdc and dc combo to make the dish cloth a bit wider. 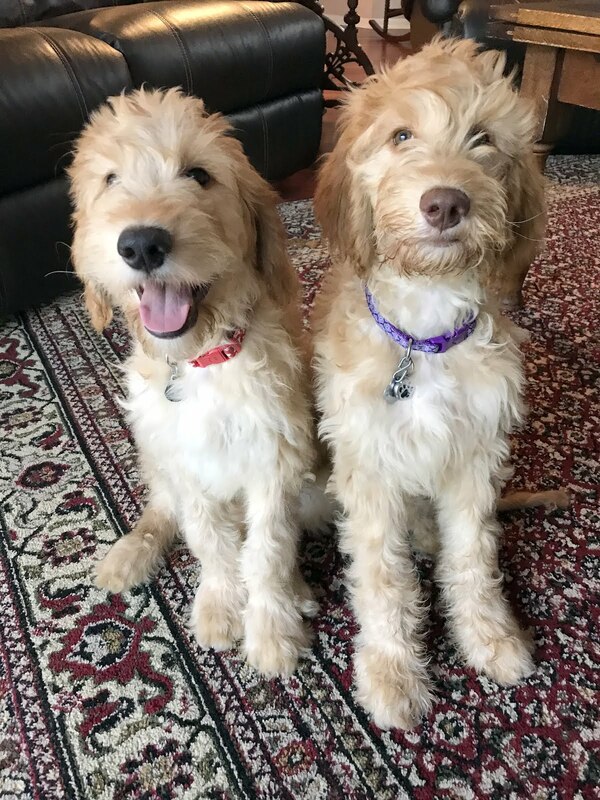 I can't tell you specifically what I did. Next time I make these I won't do hdc in the middle section (yellow), I'll make it all dc so it will be wider right from the start. I used all of the red ball of yarn, 200 yards and a bit of the yellow, so maybe 250 yards for this project. I hope to surprise her with these on Monday. 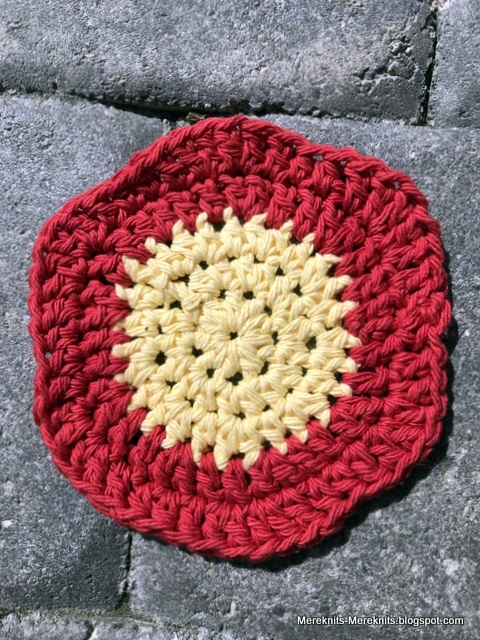 With the little bit of red yarn I had left I made this coaster, nothing should get wasted, right? Work was a bit brutal this week with my headache from h*ll and of course all the driving and behaviors I have to deal with on a regular basis. There was also a report due and oh yes we are getting new cabinets and counters in our master bath, that was fun to clean up after a 13 work day. The cabinets are in but the counters won't be in for a few weeks. We are brushing our teeth in another bathroom, no sinks or faucets in mine. Soon it will all be done and I can check it off my list of things that need to be done to this house. This photo was taken this morning. It is all sorts of wonky but it just makes me laugh. My father used to wear his white t-shirt, khaki shorts and white socks all the time, I mean everywhere he went. So while getting Little Buddy dressed today he did not want to remove his t-shirt that he slept in, and well he looks very much like my father did, stain on shirt and all. When he went out to the store he did change and put on a real shirt, still I feel he was channeling his inner Papa. By the way I still am missing my dad, seems like there is so much I'd like to talk to him about and I can't. Speaking of Little Buddy, he has been very much a pistol lately not saying nice things to his baby sitter or his speech therapist. We have had to have several talks and he has written two apology notes in the past week. I think he is hearing things at school and frankly does not know how to use or not use them correctly, so he tries them out on people he loves. He does not have little friends in the neighborhood to try stuff out on, so it falls to his family, baby sitter and therapists. When I woke him up for school on Wednesday he was very, very sleepy. I carried him into the bathroom and put him down on the potty and told him to be a nice boy at school and to get busy with his work and only say nice things. He then said to me, with his eyes almost closed with sleep, "Don't worry Mom, I won't say pissed." Now that is a good idea don't you think? Have a great weekend my friends. I have baby blankets to get back to making. Wish me luck. Don’t we hate colonoscopies,well the prep anyway.The headaches come because of dehydration I think..
Good luck with the baby blanket! Those dishcloths are just too cute. How generous of you. I'm sure they will much appreciated. Glad your procedure went well, and that it's over with! I had my first in the summer and was very nervous, mostly of the drugs, because I react badly, so they suggested trying it without (about 20% do it without medication) and I did, and it was fine. 12 minutes, the doctor told me. Interesting to watch on the screen, too. Love the green scarf; I'm craving colour just now and that is such a fresh look. Enjoy your baby blanket making. That boy just cracks me up! Glad the colonoscopy went well. I get to go again in three years because of polyps last time, but it is a small sacrifice to stay healthy. 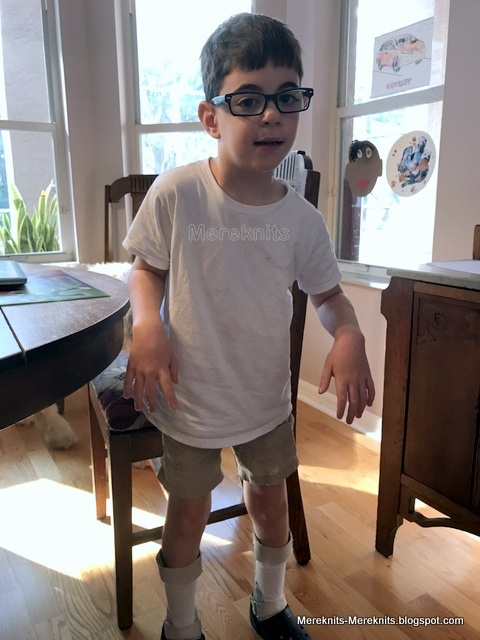 What a growing up little boy - thank you for sharing his sleepy ' don't worry Mom I won't say ...' Good that the colonoscopy is in the past, lifesaver for many and freedom from worry when things are 'see you in 10 years'. Hugs and feel better soon. Beautiful yarn workings! And isn't parenting a trip!! Ms. Opal is going to love those flower cloths. They are so cute. I need to schedule a colonoscopy this year. Soon! Glad yours went ok. Ukky stuff to drink but afterwards it's fine. Cute dishcloths! Funny story of LB looking like your dad. Good memories. Hard when parents we knew forever are gone. I still tear up when I drive in town where mom used to live. It's chilly here and a bit of snow this evening...very small amount but may get more. Have a good weekend and hope you feel better soon! hat a joy that little man is he never fails to make me smile and in this case laugh. Glad all went well with the colonoscopy. Love the cowl and the dishcloths, such thoughtful gifts. I am glad your colonoscopy went ok. Both Richard's parents and my dad died of colon cancer... I am all for early tests. 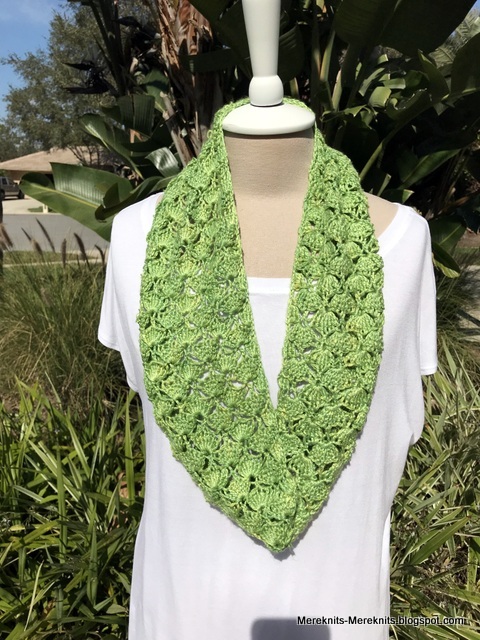 I really love the vibrant green shawl, such a cheerful colour, it makes me think of spring. Boys and inappropriate language, eh? My youngest called me a f** idiot the other day, I was speechless. Glad you were found to be Ok. I had the procedure and polyp removal but not all and was referred subsequently given an op, large polyp removed, bits of bowel donated, cancer confirmed but......discovered so early no follow up needed. Obviously now on regular checks. Why have I shared(I never have before) well I know the tests scare people but I had no symptoms at all and if I'd declined tests maybe I would no longer be here. I just want to add to Merediths voice. Don't ignore, avoid or pretend it's not needed. If offered medical checks, take them . Even if the result isn't what you want to hear, rather that, which you WILL deal with than suffering later. And of course it may well be a happy confirmation that all is fine. Sorry if you read this and inwardly grown but if it helps one reader it's worth it. Ha-ha! You and Little Buddy always make me laugh. I definitely get a migraine if I go without food for too long. No wonder the fasting hit you hard. But you still managed to finish some lovely projects. I have so much I need to do and yet I accomplish very little. My mood seems to really be affected by the weather lately and today it was major drear. Hope you are having a good weekend. My goodness! LB does make me laugh - 'pissed' (of all the words to use as an example) while on the potty. I suspect he has a wicked sense of humour in there - but I can imagine it's a trial for his teachers, therapists and yourself! As for your good self, I am so glad that your procedure when okay and 10 years between scans is fantastic. You give good advice about not putting it off. I have had scans on a more frequent schedule because of medical history. It means we catch anything early. How did the medicos manage your hypoglycemia? That washed-out weak feeling afterwards is horrible. It takes me days and days to recover. I get dehydrated very quickly so I need to do the prep in hospital. If they don't hook me up to fluids straight away, they can't find veins later when they need it when I am totally wasted from fasting. My body doesn't cope with physical stress at all. It just triggers all my MCTD issues. Just when I found a technique to cope with the nasty gagging taste of the prep solution, they changed the rules and banned me from chasing it with something sugary! Thank goodness we are both well at the moment. Like you, there are times when I too wish my dad was still around to talk to. So often things arise that I would love to discuss with him. I wonder whether LB will channel any other traits of your father! Love the Springlike colour of that cowl. And the Springlike motif of the dishcloths. I think the White Teeshirt is the Uniform Of Men Of A Certain Age. Just be glad that there are not holes under the arms! LOVE the color of your cowl, and the design. Looks very springy to me, which is nice given it's only about 20 here. Come on Spring, I'm in countdown mode. Buddy no doubt is picking things up at school, just as you say. All part of the learning, isn't it. Though sometimes hard to deal with. I've had 4, maybe 5 colonoscopies. I HATE them, and have a lot of trouble with them; but...they are important. I keep hoping medical science will come up with something more humane. I don't have a problem going without eating, but typically I'm down for 3 to 4 days due to the prep. I'm thrilled they've changed the guidelines about how often you have to have them. Used to be 5 years if no ployps were found and 3 if some where found. Believe it's 7 and 10 years now unless a strong family history and then maybe 5. Ahh... the things they learn in school! Glad the colonoscopy went well. LOVE the dish clothes! I may have to risk the carpal tunnel and crochet myself a few. Happy, happy Sunday sweet Meredith. I hope you’re getting some rest today so you can prepare for another busy week ahead. I honestly don’t know how you do it all. First of all, I’m so glad that your colonoscopy went well. The prep is the worst for me. Especially the last one I had. Two colonoscopies in six weeks was a little much and the second one was a weeklong prep. No food, just clear liquids for 7 days. It was awful. The procedure itself is a piece a cake after that! And I only have three years until I have to do it all again. Yuck. I would love to be able to touch that beautiful scarf. What a lucky lady who receives it. And for you to make all of those dish cloths for the foster helper is a testimony to what a wonderful person she must be. You are sweet to do that on top of all of your other tasks. I really did laugh out loud at your story about Mr. B. Haven’t we all been there at one time or another with a child? He is a cutie. We had 12 inches of snow Friday and Saturday, a little bit of a break last night and this morning, but now it’s snowing again with another 10 inches predicted by tomorrow evening. What was it I was saying about the nice winter we were having? Ha! I know better than to say things like that out loud. Wishing you a most wonderful week my dear friend. Praying for no headaches, easy traffic and sweet little clients. I agree with your colonoscopy talk. The worst for me was the prep, blech. I bet they will never have an easier way - they make too much money right now :) I love the buddy stories!!! My toddler that I babysit decided to sass up a storm at me, and she doesn't go anywhere to learn it! So go figure. Your cowl is beautiful I hope your week ahead is headache free! I'm impressed with your crochet prowess! That is a truly lovely scarf. And love those flower power dishcloths! I am one of the 40%, so I am on a three-year colonoscopy schedule. I wish I handled the prep as well as you do! I am dreading it. You have been so productive! Your dishcloths are just darling. Someday I'm going to learn crochet. There is so much swearing and other bad words these days so I am not surprised that LB picked up some of that. I can't believe the way students are allowed to talk in my school. I remember when calling a teacher a "b****" would be an automatic suspension. No more! How will these kids ever learn how to behave in the real world? Great news on your colonoscopy! I loathe the prep. I really really do. Hoping your headaches get the heck out of town! Im so sorry you have to endure them. Lil B is too much . I laughed and laughed .Your crochet work is amazing as always! I see SUNSHINE in you photos....FUN!!! Little Buddy is adorable . . . stains and all! I love the crochet cowl. Could you please tell me where you found that pattern . . . I'm pleased that your procedure went well. I love the colour of your scarf. I do like the photograph of Little Buddy and had to laugh at what he said. Alright I have big colonoscopy fears. I needed to hear that. I'll need to hear it and remember it soon I think. I'm terrified as I write that. Anyhow, I find it's a fine line between little boy and old man. A line that I love dearly. LB is so cute in that photo. I'm sorry that he's been a bit more of a firecracker with everything going on. (Really Mere, I'm exhausted for you in sympathy.) The headache alone can break a person. Here's to a better week for all. I'm going to live "I won't stay pissed." this week. I think it's a mantra that is both applicable and I can probably get behind because it will make me laugh every time I think about it. Hello Dear Friend. So good to hear that your test went well. I have had 3 colonoscopies and I do agree, the prep is far worse than the actual procedure. I must have missed something though, my prep was only the day before and it wasn’t fun. First time 4 polyps were removed. I do have diverticulitis though, ugh! I’m looking at your little Buddy, and he is sure growing. It seems since I miss weeks of postings and the next time I read your blog I see he is growing by leaps and bounds. I am glad that you are still doing your needleworks. I have not done anything since last winter when my hands started giving me grief. Arithritis and cramping became my main issues. Still haven’t gotten my blog back up and running. Glad to hear that the procedure went well and is behind you. Love the makes and that cute photo of Little Buddy. I am gald to hear that you are ok after your colonoscopy.My sister's brother-in-law has a colonoscopy and an operation to remove the polyps almost every 3 months.It is such a devastating thing but they endure it fearing the worst and hoping for the best.My prayers are with him. Good luck with your baby blankets, share with us when you finish. New Peach Odyssey Hooks from Furls! Six Months Later, an FO Post!